Singer Mr. 2Kay is currently in London to promote his latest album titled, Elevated. As a sequel to his album listening party held on February 11 at the Tilt Terrace, Lekki, Lagos, the singer will be hosting friends and fans to his Elevated Album listening session on Thursday – April 12 at ESQ Lounge, Kent Road, London. 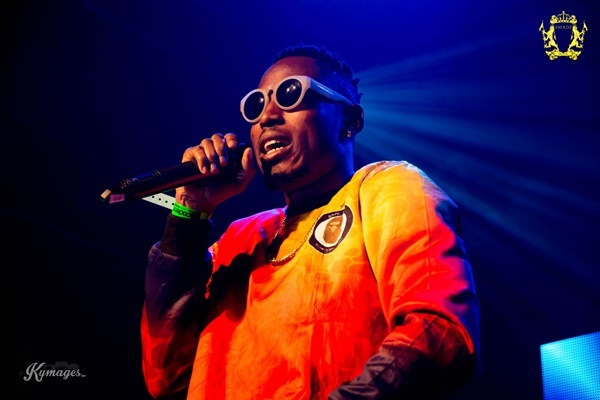 Already Mr. 2Kay is rekindling his force in the city of London as various radio stations are beginning to interchange his previous releases including “Bubugaga,” “Ladder,” and “Bad Girl Special” with his new songs like “Banging,” “Belema,” “God Can Bless Anybody,” and “My Lover” off his 'ELEVATED' album. He has also been going round various radio and TV stations to discuss his recent album. So far Mr. 2Kay has thrilled guests at Seyi Law’s ‘London Must Laugh’ comedy show, and Falz UK Tour. The singer will also be shutting down Club M in Coventry on Saturday April 7 before heading to The Lounge in Manchester and then London, before heading back to Nigeria to commence rehearsals ahead of his upcoming Elevated Concert holding in Port Harcourt. 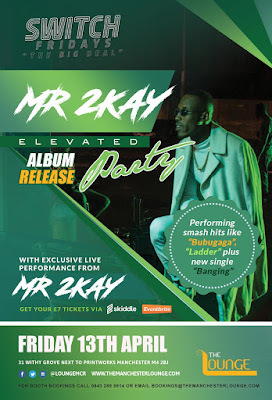 For more on his ongoing UK tour and upcoming Elevated Concert, follow Mr. 2Kay on Instagram @mr.2kay, Twitter: @mr_2kay and Facebook: @iam2kay.